The project used yards signs with provocative questions as a way to market the project. 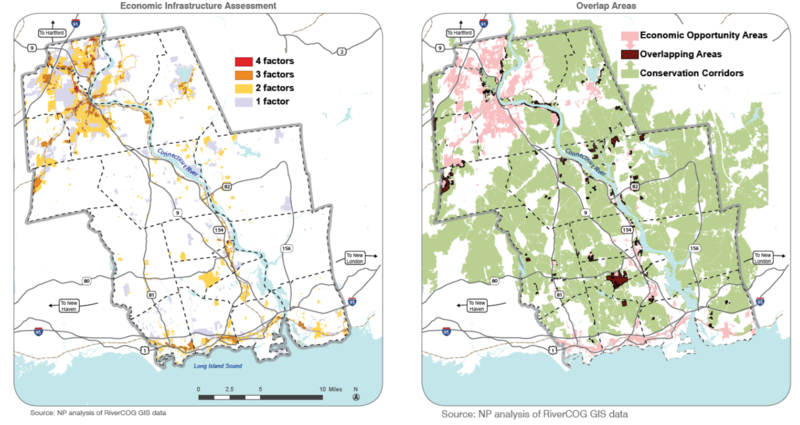 NP served as lead firm in the preparation of an economic growth strategy for the Lower CT River Valley Council of Governments. The study covered a range of issues including downtown development, housing, job and opportunity creation, and preservation of the region’s high quality of life – its key competitive advantage. The plan analyzed the region's economic infrastructure and introduced a community typology which enables each town to think about economic potential at a scale appropriate for its size and character. The planning process incorporated a variety of engagement techniques including pop-up workshops, regional forums, and online surveys. It also used novel ways to market the project and visualize regional input. The resulting plan is focused on efforts within the region’s control and seeks a balance between the conservation and development pressures facing the river valley. NP has been selected to lead the plan's implementation, which includes the development of a business case and pitch book for the creation of a regional development entity. NP directed the creation of a series of maps to understand the region's economic infrastructure and potential land use conflicts.